bike build | Bikes, Beer, and Birds... In No Particular Order. Just Riding Along… Maiden Voyage. After a day of waiting, took the Troll on it’s first “official” ride. Not as long as I had hoped, but with prior commitments and nasty weather on course, just a quick 3 mile spin in the woods with the camera. The Troll handled as expected. It is a rigid steel bike, not much to set up or tweak on the ride. It is nice riding a fully rigid bike, no adjustments to finicky suspension setting, no rider sag to set, just get on the bike and ride. Kind of like when you are a kid, and your bike is a single speed BMX bike. Not much to worry about. Just pedal. I am still trying to figure out my camera, so today I tried to capture a self portrait. After setting up the tripod, and setting the timer for the longest setting, I still did not get the shot that I had wanted. I still need to work on that a bit, all in due time. Just Riding Along… Troll complete! Pacer decals in black, on the Ford blue powdercoat. Just a few quick pictures from today. Not much time to take a ride this evening, just a quick spin around the block. Who knows when the trails around here will finally dry out (or freeze) so I can test this beast out in the woods. Hope to get some real saddle time in this week. Plans for the Troll already. Once the rear rack I am wanting comes back into stock, I will be able to hit the road on some off road overnight trips. I am also thinking about some sort of frame bag, maybe just a partial, to increase my carrying capabilities. Another purchase that will happen probably next week will be a set of road tires for commuting purposes. Still on the fence as to what model, but I am sure they will be big. That’s how the Troll rolls right? Just Riding Along… Surly Troll part 2 cont. Maxxis Ardent 26×2.6 fit, just barely, with the axle pushed all the way forward. Mocked up, no headset installed as of yet. Checking the fit of the Salsa Down Under rack. I am beyond excited about this build, slowly but surely coming together. Just Riding Along… Surly Troll ordered! Finally, after having almost a mental meltdown of what to do cycling wise, I pushed the little red button. Order complete. The Surly Troll is on the way! I am beyond excited to put this bike through the paces, on street and dirt. It will be good to have a mountain bike again, I spent all of 2011 without one. Weird. 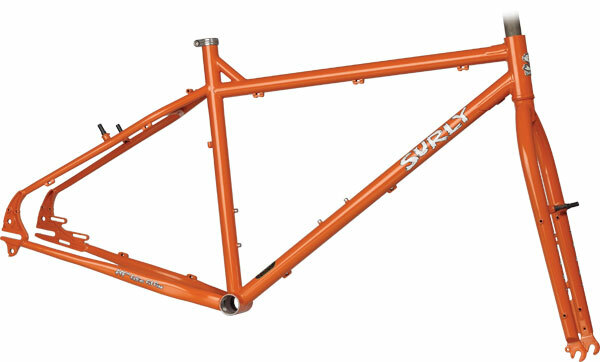 Frame pic from Surly’s site.